Northwest Dance Network’s mission is to inspire the art, joy, and excellence of non-competitive social dance. We provide respectful educational forums where beginning and intermediate dancers can safely meet and connect to experience the joy of dance and to build their skills, coordination, and confidence. Through effective, well-tested teaching methods our friendly, supportive, and highly trained instructors and teaching assistants impart solid dance fundamentals, moves, and partnering techniques. 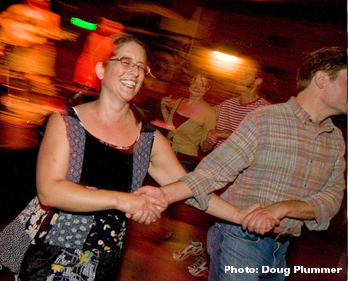 The Seattle dance community gathers at our bi-weekly dances to nurture and celebrate live music, hone their dance skills, and expand their sense of community. We provide outreach to communities in the Pacific Northwest through programs that offer dance to the elderly and foster high school instrumental music programs.